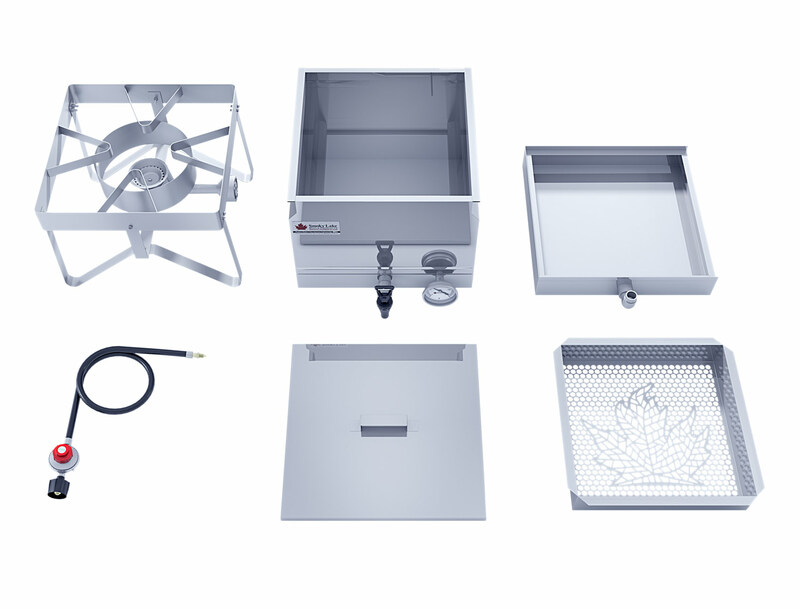 The Smoky Lake Steam Bottler system is one of the most versatile pieces of equipment a maple syrup producer can own. 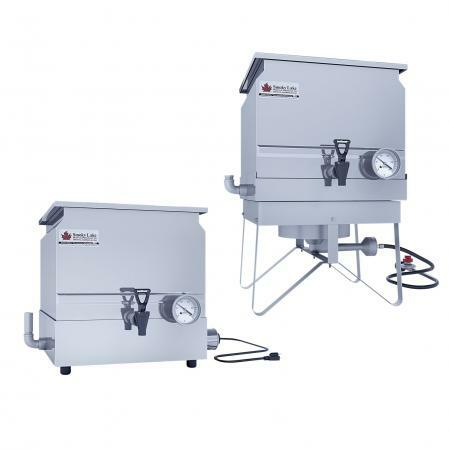 We’ve packaged our popular Filter-Finisher-Bottler and Steam Tray with your choice of either an Electric Heating Element OR a High Output Burner with a Stainless Steel Stand. SHIPPING AND SHIPPING INSURANCE INCLUDED! A Valve Reducer is recommended for filling bottles with narrow necks. This is an optional add-on. *Please note that the Burner with Stand is one-size-fits-both. The photos show the larger bottler sitting on top of it. When using the burner with the smaller pan for bottling, the pan will need to sit slightly off-center on top of the burner. Will You Be Filling Bottles With Narrow Necks? A Valve Reducer can be added to your Tomlinson Valve to make it easier to fill bottles with narrow openings. 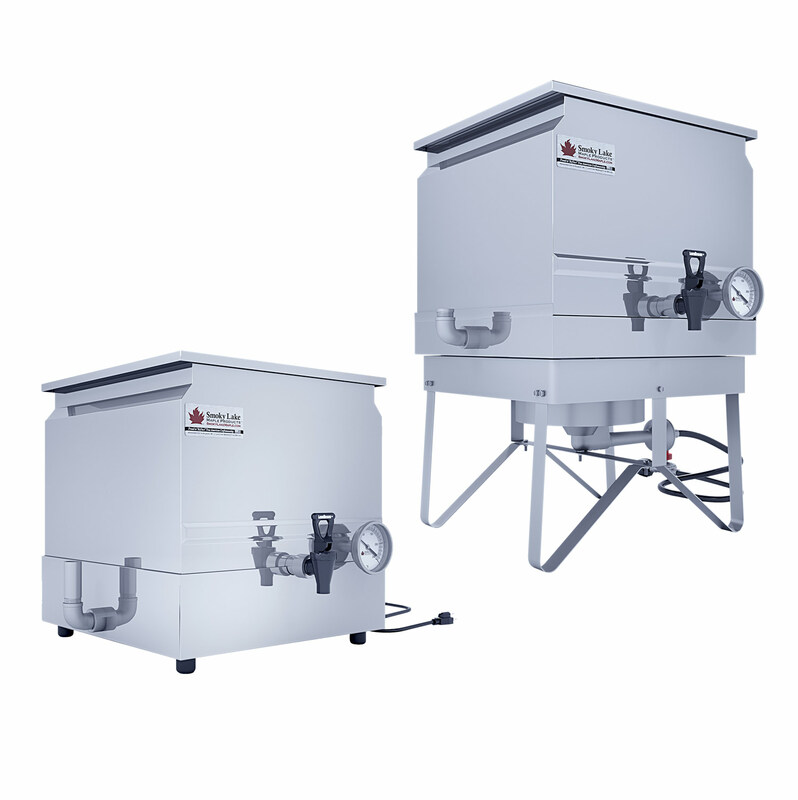 This system can be used for filtering, finishing and bottling, and makes the transition between these steps seamless. The pans are handcrafted out of 22ga mirror finish stainless steel (which is food grade and rust resistant). 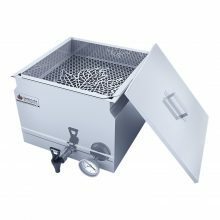 All pans are handcrafted and all TIG welds come with a limited lifetime warranty. The syrup pan has built-in full-length handles on each side. Complete set of Flat Filters are precut and ready to go. Place the main pan on a sturdy, level surface. Insert the Filter Tray on top of the main pan. Make sure the draw-off valve and thermometer are securely threaded into the front of the main pan. We recommend using Teflon Plumbers Tape (not included) on all threaded connections to prevent binding and to ensure a tighter seal. Pour hot syrup into the Filter Tray and let it drain into the main pan below. Remove the top prefilter as necessary as described in the “How to use Flat Filters” section below. Since you will always use the filters with the same side facing up, denote which side is UP with a marker on the edge of each filter. That way if there is any sediment left in the filters, it will not get flushed out into your syrup the next time you filter. Place your base filter (usually made from Orlon) at the bottom of the filter tray and then place a stack of about four prefilters on top of it. Note that the filters need to overhang the edges of the filter tray to make it easier to grab and adjust them later on. You may choose to use a clothespin or a binder clip to clip the filters together in the corners. 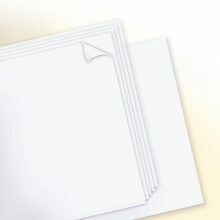 This will help prevent the edges of the filter papers from falling over into the tray. When the top prefilter clogs with sediment, shimmy it out and the syrup will flow through again. When the next prefilter clogs, shimmy out that prefilter and so on. The prefilter material is composite and can be used over and over. They rinse very well. Never run your syrup directly into the base filter unless you have very little to filter. Clean the filters with hot water or the steam from the evaporator. Do NOT wring dry. Store in a clean, dry, odorless place. After filtering your syrup as described above, cover the pan with the lid so that no evaporation can occur. Perform a density test to ensure the syrup is suitable for bottling. The density should be between 66º – 66.9º BRIX. 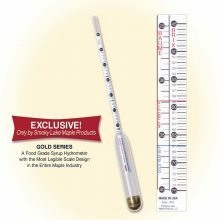 We recommend using a Murphy Cup and hydrometer to easily and quickly get an accurate density reading. If your syrup is too dense, crystals will eventually form at the bottom of your containers. To reclaim perfect density, slowly stir in a small amount of distilled water or sap until perfect density is achieved. If your syrup is not dense enough, you will need to use your Steam Tray to heat the syrup and do more evaporating. Remove the Lid and Filter Tray and set them aside. 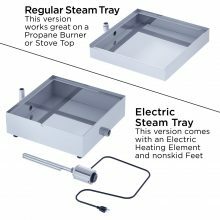 Then follow the instructions for using your particular type of steam tray below. 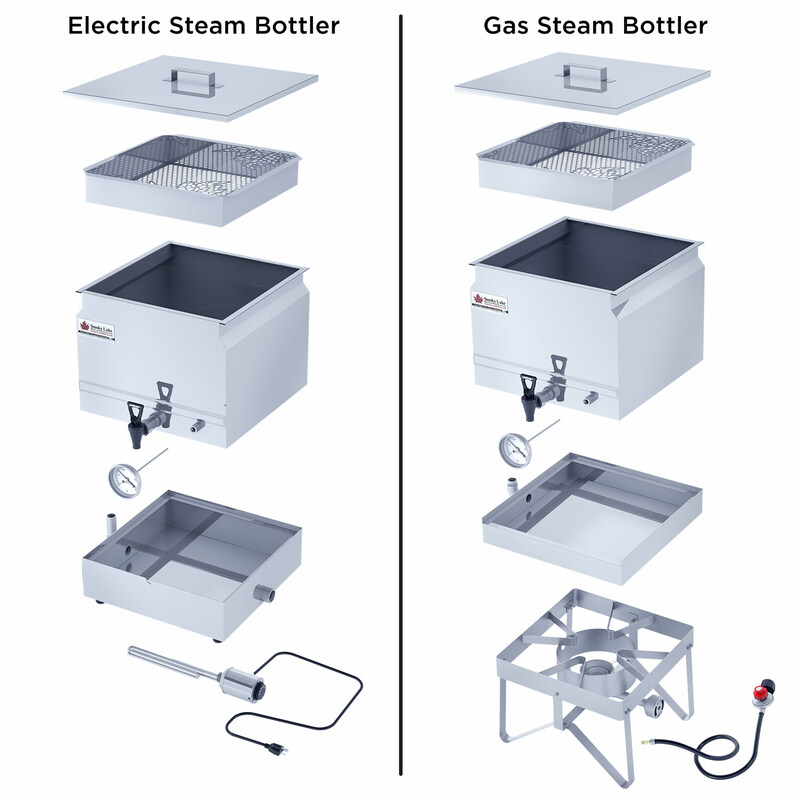 (electric vs gas-fired.) The steam will evenly heat the bottom of your main pan, so you can avoid the hot spots which can generate sugar sand. Please note that if you have a LOT of evaporation to do, it will be faster for you to remove the Steam Tray and put the filter pan directly onto your heat source (either a stove or gas-fired burner). 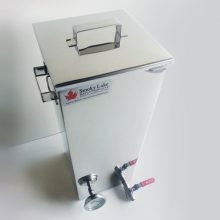 However, if you do not use the Steam Tray, you may need to re-filter your syrup to remove sugar sand before you do any bottling. Once you have achieved proper density, bring the syrup temperature to 180ºF. Monitor syrup temperature using the thermometer on the front of the main pan. If you are starting with cold syrup, heating the syrup with the Steam Tray can take about 2 hours. It is fastest to put the syrup into the pan while it is still hot and then use the Steam Tray to MAINTAIN the proper temperature. 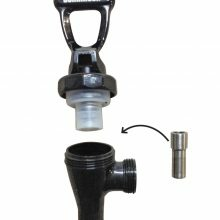 Use the Tomlinson Valve to fill your clean, food-safe bottles/cans with syrup. Leave a small amount of air at the top of each container. Give a quick shake each container to allow the syrup to coat the inside of the bottle and neutralize any bacteria that may have been present. It is NOT necessary to lay the bottle on its side after shaking. Laying the bottle on its side can make it difficult for some caps/tamper resist seals to adhere securely. Make sure to wear rubber gloves to protect your hands from hot syrup. 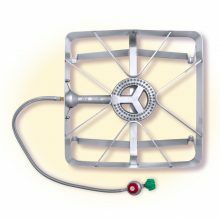 Place the Gas Burner and Stand on a sturdy, level surface. Fill the Steam Tray with approx 2″ of water and set it on top of the Gas Burner and Stand. Depending on your generation of Steam Tray, the lip of the tray’s rim will either be open on one side OR it may have a circular notched on one side. That is the side of the Steam Tray that should be facing forward. 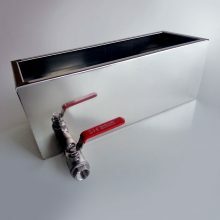 Place the Main Pan on top of the Steam Tray so that the draw-off valve is facing you. If you have not done so already, fill the main pan with syrup, filtering if necessary. Light the gas burner and allow time for the steam from the Steam Tray to heat your syrup to your desired temperature. 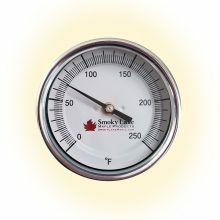 Monitor your syrup’s temperature using the thermometer on the front of the main pan. Note that you should NOT see any significant amount steam escaping from the Steam Tray. If you do, make sure your main pan is sitting on the Steam Tray properly. If a small amount of steam is still escaping, you may need to add water to the Steam Tray via the side funnel. NEVER heat the Steam Tray when there isn’t water in it as this could cause the Steam Tray to warp. 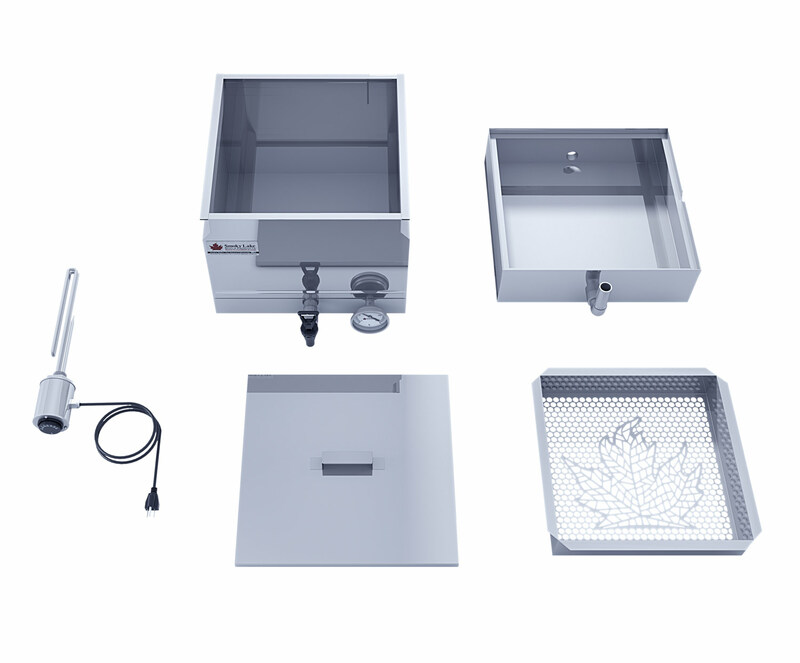 Fill the Steam Tray so that the electric element is FULLY immersed. If not fully immersed, corosion may occur while the element is hot. Set the Steam Tray on a sturdy, level surface so that the side with the notched edge is facing you. Then place the main pan on top of the Steam Tray so that the draw-off valve is resting in the notch on the steam tray. If you have not done so already, fill the main pan with syrup, filtering if necessary. Plug in the electric element. Allow time for the steam from the Steam Tray to heat your syrup to your desired temperature. 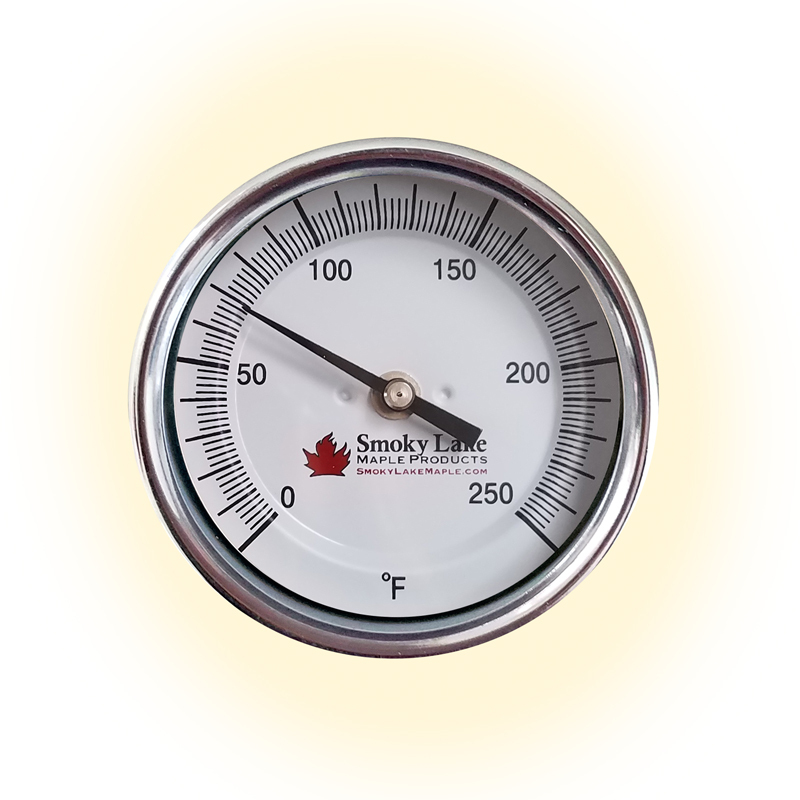 Monitor your syrup’s temperature using the thermometer on the front of the main pan. Note that you should NOT see any significant amount steam escaping from the Steam Tray. If you do, make sure the main pan is sitting on the Steam Tray properly. If a very small amount of steam is still escaping, you may need to add water to the Steam Tray via the side funnel. NEVER heat the Steam Tray when there isn’t water in it as this could cause the Steam Tray to warp and will cause damage to the element. NEVER heat a pan that doesn’t have any liquid in it as this can cause warping. Never place your face or other body parts in steam. Remember that equipment and syrup will get HOT. Wear protective gloves, goggles, etc to prevent burns. 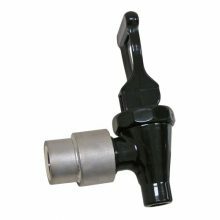 Our high-end Tomlinson Valve is now the standard valve for this unit. We also now include a refill funnel on the side of the Steam Tray. You will be able to determine your current water level by looking inside the funnel. Precut Filter Sets are now included with every bottler. Steam Tray rims have been modified to make them more universal with other brands of pans.